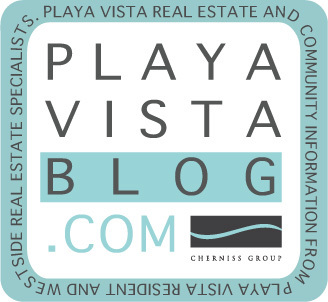 Playa Vista Real Estate Blog: So Who's Benefitting from Yesterday's Carnage on Wall Street? So Who's Benefitting from Yesterday's Carnage on Wall Street? The stock market suffered its greatest single-day point loss since September 17, 2001, and its sixth-biggest point loss in history yesterday - upon news of the government's failure to back Lehman Brothers, the shot-gun wedding of Merrill Lynch to BofA, and AIG scrambling for cash. The events on Monday caused investors to move their money away from risky investments like stocks and into safe havens of government-backed debt (including mortgage-backed debt). As traders poured into bonds, bond prices rose. Bond prices jumped, and the dollar got a boost against the euro and yen yesterday. 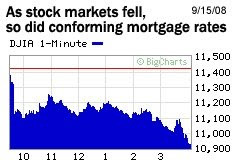 Because mortgage rates move in the opposite direction of mortgage bond prices, mortgage rates ended up falling on Monday. The Federal Open Market Committee met today with rates left unchanged, despite talk of a rate cut in wake of yesterday's event. In addition, the Consumer Price Index released today reported that headline inflation prices fell by 0.1% due to the drop in energy, transportation and housing costs. A cool reading on inflation could have helped mortgage rates. So, since the interest rates remained unchanged, word of possible AIG rescue, and the positive inflation reading; the stock market ended up rallying and left mortgage rates up by .125% today. UPDATE: Feds takeover AIG with $85-billion bridge-loan bailout, Barclays buys Lehman.